This graph shows 4 levels of comparisons. First, it compares among three regions. Secondly each region it compares Actual (first two columns) vs Satellite (second two columns). 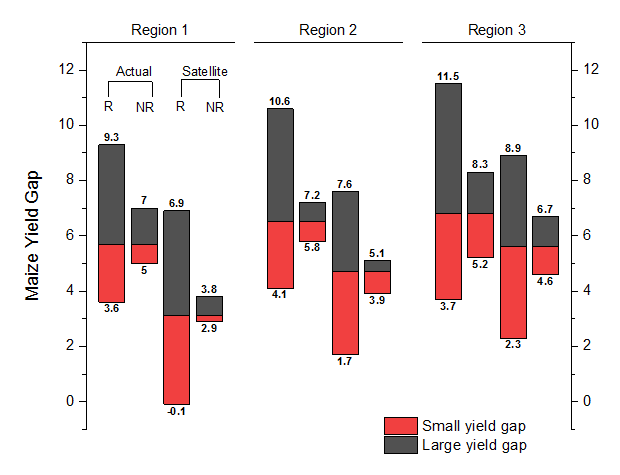 Within each two group of columns, it compares R vs NR, and Small yield (red) vs Large yield (black). The floating column helps to plot from the same mean value, so it increases the visualization effects when comparing different levels. The graph also can be used to make prediction based on the mean values across regions. This floating bars graph is plotted in trellis plot from grouped data. You can arrange and customize the columns by grouping in the Panel tab of the Plot Details dialog. To know how to plot this graph, please download the above project file (Zip file). There is a Note window to show the detail steps for plotting this graph. This graph was created by Bhupinder S. Farmaha, University of Nebraska-Lincoln, USA.